Shawnee State University’s Kyle Trapp could have as many as 45 individuals on the inaugural version of the SSU eSports roster in 2018-19. The eSports industry is expected to have 580 million viewers by 2021. Over the past decade, there hasn’t been an area of sport that has seen as much of an uptick in interest as the world of eSports has. The industry is, after all, producing hundreds of millions of dollars in revenue behind an audience that is expected to triple its viewership over a five-year period. With the opportunity to build something special behind the growing field that is eSports and a top-notch gaming program that is already well-established at the school, Shawnee State has wasted no time taking advantage. First-year head coach Kyle Trapp, a 2011 graduate of Northwest High School and a 2016 graduate of Full Sail University, could have as many as 45 members in the inaugural version of the SSU eSports roster, which means that the eSports program — with the amount of participants in the program in addition to the amount of dollars that the field generates — could become a major attraction, to say the least, for Shawnee State University as a whole. To believe that Shawnee State may have a true gold mine on its hand, it only takes one look at the facts to see how that could be possible. According to Newzoo.com, the global eSports world had 281 million viewers in 2016 alone. By 2021, that number is expected to grow to 580 million individuals. And even when not looking at the massive amounts of individuals who are tuning into the live streams that are omnipresent within the eSports world, the revenue that is generated is simply incredible. In North America and China alone, $509 million worth of revenue, or 56 percent of all global eSports revenues, was produced, according to Newzoo. In Ohio, eSports is already big-time. One doesn’t even have to go past Scioto County to find that out, as Jordan Hyland and Tyler McGraw’s Complex eSports business has drawn individuals from all four time zones in America into the county. Then, there’s Game Arena in Hilliard, a suburb of Columbus who is seeing similar success. In the case of the former, Hyland and McGraw, after only two-and-a-half years of operation, have seen enough interest to move to a new location from The Complex grounds in West Portsmouth to its new location, which will open up in July on 1548 Gallia Street — a stone’s throw from SSU. Shawnee State, in general, is already in a great position to capitalize on the growth of the business. 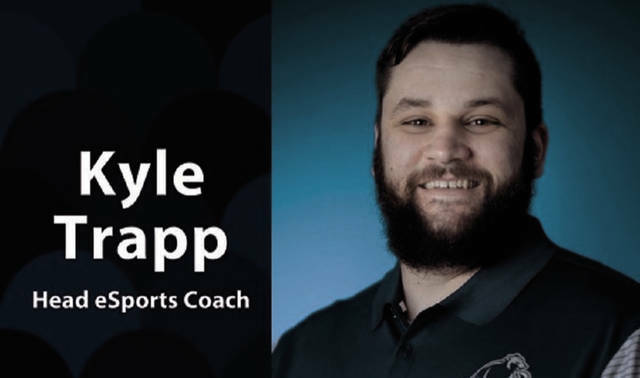 Trapp, who was named as the first head coach of the eSports program on March 14, worked with SSU athletic director Jeff Hamilton and the National Association of Collegiate eSports Director Layne Shirley en route to garnering acceptance into the NACE by May 15. The association, which has 76 eSport programs in the NACE across the United States, will have schools such as Boise State, North Texas, Georgia State, Georgia Southern, Western Kentucky, Miami (Ohio), and Mount Union among others involved in the program. Fellow Mid-South Conference members Campbellsville (Ky.) and Pikeville (Ky.) are also a part of the NACE. In addition to competing against well-known brands, Shawnee State will be doing so across popular game modes. In all, the Bears will be competing in Hearthstone, League of Legends, Overwatch, Rocket League, and Smite in 2018, and more competitions could be added across additional games before the start of the year. And for those who believe it won’t be taken seriously as a sport, think again. After all, it is a business that could very well be producing billions of dollars in revenue by the end of the current decade.